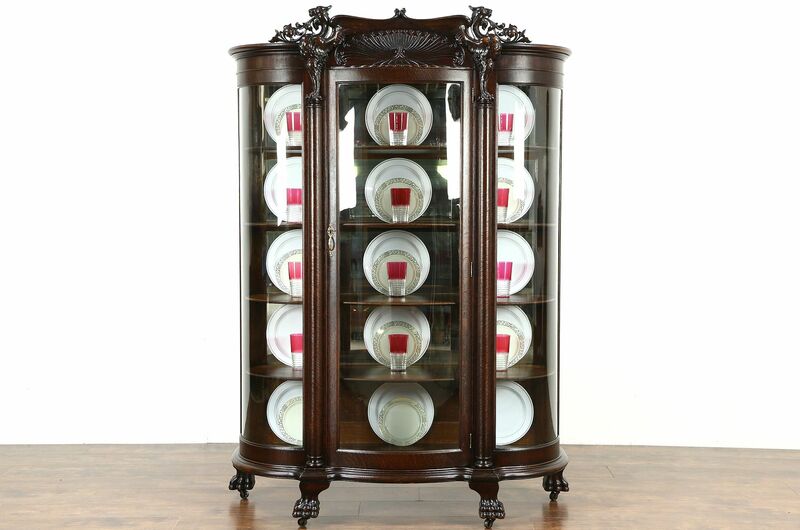 A Victorian period curved glass china or curio display cabinet was carved of quarter sawn oak about 1900. Three dimensional griffins, piercing and lion paw feet are dramatic on this American made antique furniture. The original finish has some crazing from age and has been preserved with clear varnish. Shelves have grooves for displaying plates if desired. Interior mirrors have a little "smoke" to show their age, all three curved glass panes are original and wavy. Brass hardware is original, the lock and key work. Measurements are 53" wide at the tips of the feet, 18" deep and 73" tall including the original wheels, which are removable. Please view 22 photos at full screen size for best detail. Related items in photos are sold separately.